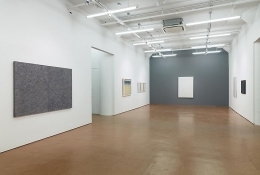 Alexander Gray Associates presented the exhibition Overcoming the Modern; Dansaekhwa: Korean Monochrome Movement, guest curated by Sam Bardaouil and Till Fellrath, and accompanied by a fully-illustrated catalogue. 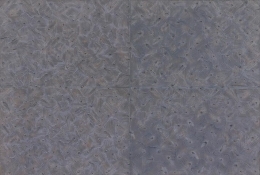 In the late 1950s, a disparate number of young Korean artists discarded realism and figuration and adopted a monochromatic palette and artistic techniques that highlighted the flatness of the canvas as a foundation for later accretions and the physicality of the used materials. 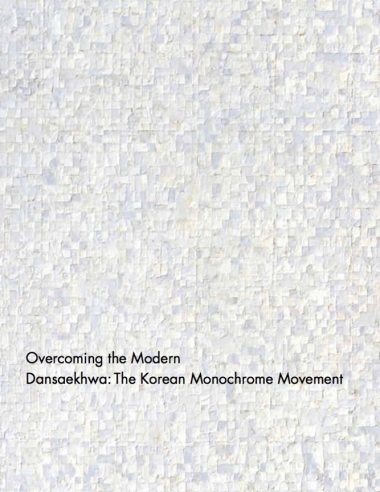 By the mid-1970s they had become known as Danseakhwa: The Korean Monochrome Movement. Chung Sang-hwa (b.1932, Young-Duck, Gyeongsangbuk-Do, Korea); lives and works in Seoul, South Korea. He received his BFA from the College of Fine Arts of Seoul National University in 1956. Over his career he has also lived in Japan and France. 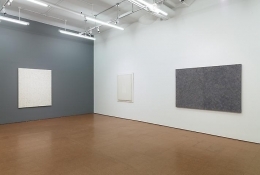 His painting practice revolves around process, and he developed a meticulous painting method in which he rips paint off the canvas and then refills it, resulting in grid-like geometric forms. Chung has exhibited extensively in Korea, Japan, and Europe, including at the Leeum Art Museum, Seoul (2007); Seoul National Art Museum, Seoul, Korea (2004); Busan Museum of Modern Art, Busan, Korea (1998); Sun-Jae Museum of Contemporary Art, Kyung Joo, Korea (1991); Museum of Modern Art, Saitama, Japan (1986); and Brooklyn Museum, Brooklyn, NY (1981). In addition, he has participated in many international biennials, most recently the Poznan Biennale, Poznan, Poland (2008) and the Third Gwangju Biennale, Gwangju, Korea (2000). Ha Chong-hyun (b.1935, Sanoheong, Korea); lives and works in Seoul, South Korea. He received his BFA in 1959 from Hong-Ik University in Seoul, from which he was awarded an honorary PhD in 2000. He is best known for his ongoing Conjunction series, which he began in the 1970s. Working with hemp cloth, the artist applies oil paint to the back of the canvas, which he then pushes through to the front with an array of tools including knives, spoons, sticks, and his hands. From 2001–06, he was the Director of the Seoul Museum of Art, in 1995 he was the director of the First Gwangju Biennale, and from 1990–94 he was the Dean of the Fine Arts College of Hong-Ik University. He has exhibited internationally in venues such as Gana Art Center, Seoul, Korea (2008); Gyeongnam Art Museum, Changwon, Korea (2004); and Mudima Foundation of Contemporary Art, Milan, Italy (2003). Hur Hwang (b.1943); lives and works in South Korea. He received both his BFA and MFA in painting from Hong-Ik University. His paintings are characterized by his use of the color white, which he believes invokes diverse psychological responses. He creates his own paint out of a thick mix of natural stone powder, which he pours onto the canvas, marking the surfaces without intervention from the artist. 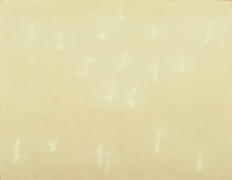 His paintings are characterized by the many shades of white he achieves. Hur’s work has been exhibited extensively in Korea, Japan, and the United States, including at the Hyundai Arts Center, Ulsan, Korea (2004); Busan Metropolitan Art Museum, Busan, Korea (1998); and the Gwangju Biennale. Lee Dong-Youb (b.1946, Hong-Ik, Korea – d. 2013, Seoul, South Korea). He received both his BFA and MFA from the School of Fine Arts, Hong-Ik Unviersity. 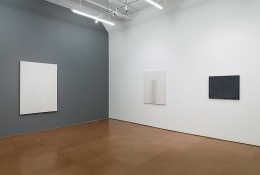 His paintings are intended to activate an awareness of perception, and are characterized by lines composed of subtle gradations of gray that run through the canvas. Often, the lines are confined to particular zones of the canvas, which abruptly stops their movement. Lee’s work has been shown extensively in Asia and Europe, and featured in exhibitions at the Seoul Olympic Museum of Art, Korea (2008); National Museum of Contemporary Art, Gwacheon, Korea (2007 and 1997); National de Grand Palais, Paris, France (1986); Brooklyn Museum, Brooklyn, NY (1981); Taipei Fine Art Museum, Taipei, Taiwan (1984); and the historic Five Korean Artists, Five Kinds of White, Tokyo Gallery, Tokyo, Japan (1975). His work is represented in public collections in Korea and Japan, including the Tokyo National Museum of Modern Art, Japan; National Museum of Contemporary Art, Gwacheon, Korea; and Museum of Hong-Ik University, Seoul, Korea. 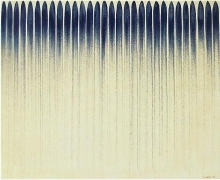 Lee Ufan (b.1936, Kyongnam, Korea); lives and works in Kamakura, Japan and Paris, France. He left Korea to study Philosophy at Nihon University in 1956. 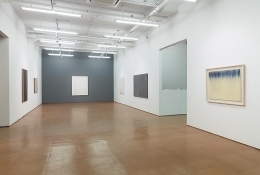 In the late-1960s, he was one of the leading theorists and artists of Mono-ha, the Japanese art movement focused on materiality, perception, and chance, which arose out of anti-authoritarian and anti-colonial sentiment. 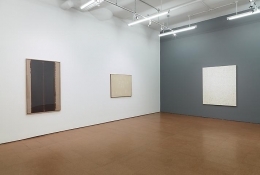 By the early 1970s, Lee had embarked on two seminal series that greatly impacted the Korean Monochrome Movement: From Line and From Point, in which his marks conveyed friction of the brush upon the canvas and the depletion of pigment. 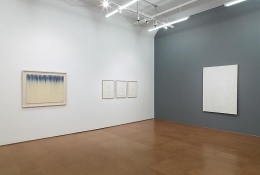 Lee was the recent subject of the 2011 exhibition Lee Ufan: Marking Infinity at the Guggenheim Museum, New York, NY. He has exhibited internationally, including recent solo exhibitions at the Museum für Asiatische Kunst, Berlin (2008); Royal Museum of Fine Arts of Belgium, Brussels (2008); and Yokohama Museum of Art, Yokohama, Japan (2005). His work is in the public collections of prominent international institutions, including the Museum of Modern Art, New York, NY; Tate Gallery, London, UK; Centre Georges Pompidou, Paris, France; Berlin National Galerie, Berlin, Germany; and Art Gallery of New South Wales, Sydney, Australia. Park Seo-bo (b.1931, Yecheon, Gueongbuk, South Korea); lives and works in Seoul, Korea. He received a BFA from Hong-Ik University, from which he later received an honorary PhD, and also studied at the Sorbonne in Paris, France. He is a leading figure in Korean modern abstract art and is credited with establishing the Korean Monochrome Movement in the 1960s. For more than forty years, he has continued his Ecriture series, which he situated between the acts of writing and drawing. This ongoing series is defined by the artist’s act of drawing lines or lineal patterns into the paintings surface. 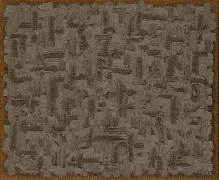 Park’s work was the subject of a retrospective at the National Museum of Contemporary Art, Gwacheon, South Korea (1991); and has been featured in renowned group exhibitions at the Singapore Art Museum (2008); Musée d’Art Modern, Saint-Etienne, France (2006); Soka Contemporary Space, Beijing, China (2005); Museum für Ostasiatische Kunst, Berlin, Germany (2003); and the National Museum of Modern Art, Tokyo, Japan (2002). Yun Hyong-keun (b.1927, Seoul, Korea – d. 2007). He received a BFA from the School of Fine Arts, Hong-Ik University in 1957. 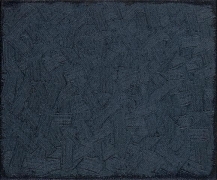 He is known for his Umber Blue series, in which he investigated the materiality of paint, time, and perception. Using only ultramarine and umber, he experimented by allowing each pigment to dry at different rates to create subtle layers of paint, diluting the colors as they seep into the fibers of the canvas. Yun’s work has been exhibited internationally in institutions including the National Museum of Contemporary Art, Seoul, Korea (2002); Busan Museum of Art, Busan, Korea (2000); Stiftung für Konkrete Kunst, Reutlingen, Germany (1997); Chinati Foundation, Marfa, TX (1994); and Tate Liverpool, Liverpool, UK (1992). He also participated in the Venice Biennale (1995) and São Paulo Biennale (1975 and 1969). Sam Bardaouil and Till Fellrath are the co-founders of Art Reoriented, a multidisciplinary curatorial platform based in Munich and New York. Integral to their practice is the critique of conventional art-historical classifications and the interrogation of the traditional mechanisms by which contemporary art is understood and presented. Their recent museum exhibitions include: ItaliaArabia (2008), the traveling exhibition Iran Inside Out (2009 – 2010) and the inaugural exhibition Told Untold Retold (2010 – 2011) for Mathaf: the Arab Museum of Modern Art in Doha / Qatar. Their critically acclaimed traveling exhibition Tea with Nefertiti (2012 – 2014) is the first contemporary art exhibition to travel internationally from a Museum in the Arab world. In 2013, Bardaouil and Fellrath were the curators of the Lebanese Pavilion at the 55th Venice Biennale. Their exhibition Mona Hatoum: Turbulence, a comprehensive survey show including more than 70 works spanning three decades of the artist’s oeuvre will be on view at Mathaf from February 7 until May 18, 2014. Currently, they are preparing 1967 – Lee Nan Young and Oum Kulthoum: The Imagined Encounter, a thematic exhibition for the Gwangju Museum of Art in South Korea opening in May 2014. Bardaouil and Fellrath have held teaching positions at the Tisch School of the Arts at New York University and the London School of Economics, among other institutions. They are regular contributors to international art publications such as Flash Art and Canvas. They are currently working on a comprehensive monograph for leading Lebanese modernist artist Paul Guiragossian. Their new book Summer, Autumn, Winter... and Spring: Conversations with Artists from the Arab World is published by SKIRA and will be released in 2014.